This is another article I wrote for a hearing loss newsletter. As you can see this one isn’t just for those with hearing loss. Many of us enjoy working on a hobby in the garage, basement, barn or wherever. Many of us would also like to listen to a descent radio. Being hard of hearing we have two problems. The first one is most radios we have in our shops sounds poor. Whether you like listening to talk or music, you will most likely find that the radio will either be not loud enough, or if it is, too badly distorted to understand. The other problem is cost. If you want a loud good sounding radio, you could buy a nice expensive one. However if you do, would you want something that nice in the garage or barn where it would get: dusty, dirty, grimy, damp, with maybe a few little mice running across it? 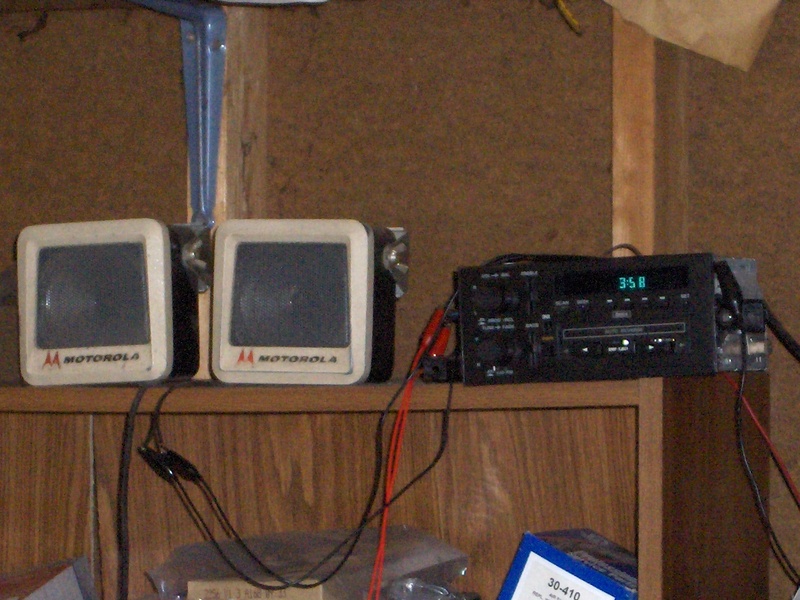 My radio in the garage can withstand dampness, dust, very hot or cold temperatures, is loud and sounds good. I also paid $10 or $15 for it. (I don’t remember, I had it awhile) What I have on my shelf in the garage is a car radio. It’s too ugly for in the living room, but it’s perfect for in a shop. You can use most any speakers you want. Mine came from a couple of Snohomish County Sheriffs’ cars. They were for the police radios. For the antenna you will need at least part of the antenna wire with the center wire sticking out. With that I attached a three foot wire to it and hung the end over the rafters. Longer is better within reason. For a power source you could use a car battery for a while, or you could use a 12 to 14 volt DC power supply. Don’t go too cheap or it won’t work well or have enough power to run the radio. I’m using one that came from a 12 volt rechargeable electric lawn mower, and it works OK on FM. (It makes noise on AM) I may go back to a battery because then it sounds good on AM and FM. Like I say: this is not a pretty set up for your living room, but for a shop that’s in a garage or barn, it perfect.